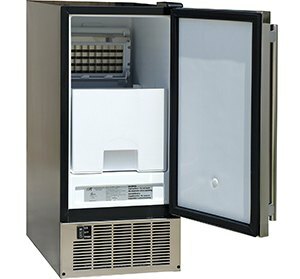 SPT IM-600US Undercounter Ice Maker is a machine that can deliver up to 50 pounds of ice per day, which is a very high quantity. Busy restaurants and tropical bars are usually in need of such a device, but we can hardly say the same for private home owners. Unless you make giant parties, every other day and have a cocktail bar at your house, this giant volume of ice will be too much for you. However, SPT IM-600US Undercounter Ice Maker can store up to 25 pounds of ice into its removable bin, so that users can safely use it whenever they have the need for crystal clear ice cubes. 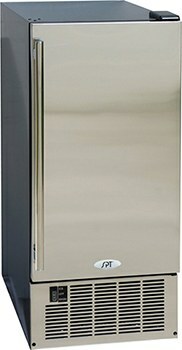 This relatively large machine can be built-in in combination with other appliances, or it can be free standing. Stainless steel door and a black cabinet are designed in a beautiful way, and a full-length handle serves as a nice ergonomic detail. Front exhaust fan allows the device to be placed adjacent to walls and other machines, but with the weight of 84 pounds and the height of 32.8”, SPT IM-600US is not a machine that you will be moving around too much. 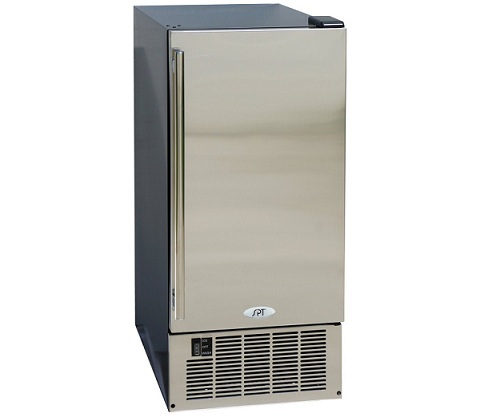 However, if your business requires high-class, crystal clear ice cubes – this undercounter ice machine will provide you with a steady flow of ice. What is interesting with this ice maker, is that ice does not actually comes out in small cubes, but rather in sheets of ice which require a light tap with a scoop to separate the individual cubes. Some people will find this feature useful, others will hate it – but, it is what it is, and we can’t do much about it. Another potential deal-breaker with this machine could be the noise because some customers have had complaints about the noise levels of this air-cooled ice maker, even though the manufacturer states that the noise levels are around 50-60 dB, which is an average number when it comes to similar devices. 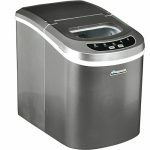 Noise can be a slight annoyance if you plan to use SPT IM-600USUndercounter Ice Maker in your home, but if it is placed in a kitchen of a busy restaurant – no one will ever notice that the machine is creating too much sound. People usually say that ice making machines are notoriously loud and that you simply have to get used to it, but in the case of this SPT product – the machine justifies the noise by producing large volumes of ice at a very fast pace.